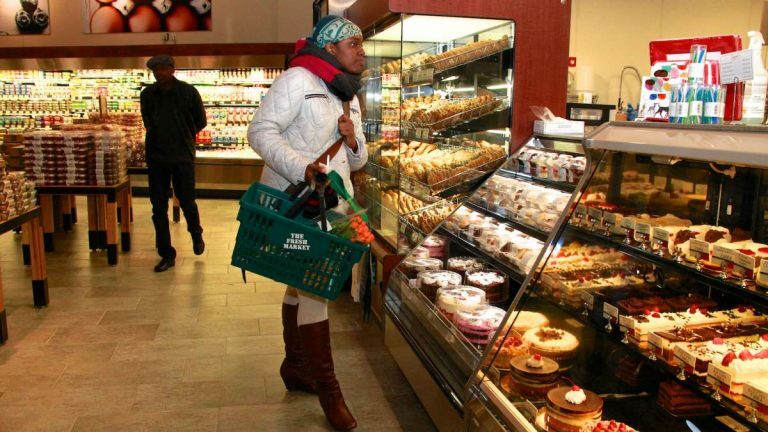 Shoppers came out early for the 8 a.m. grand opening of The Fresh Market grocery store in Chestnut Hill on Wednesday. Located at 8208-8218 Germantown Ave, the market is the first retail tenant for Bowman Properties’ new mixed-use building. As construction workers put on the finishing touches to the exterior, a few folks even began to line up outside the entrance before doors officially opened for business. They were eager to check out the grocery store that has been in the works since 2011. The grocery chain marked the occasion with a “cracking of the parmesan,” its own take on a ribbon cutting ceremony. Using chisels, an 86-pound parmesan cheese wheel was broken in half. Samples were given out to customers and the curious. Richard Snowden, owner of Bowman Properties, welcomed his newest tenant, noting that the opening became reality because of a strong neighborhood that worked together. Eighth District Councilwoman Cindy Bass also spoke during the ceremony and praised Snowden’s vision. She said the new market will help keep dollars in the community as residents have another option to buy their groceries on Germantown Avenue rather than in nearby suburbs.